the guys in my office are pretty much always craving burgers. so recently, we ordered delivery from butcher & the burger, a burger shop on w. armitage in lincoln park where you can customize a variety of burgers to your little heart's desire. the best thing about butcher & the burger? they've got a vegan burger ---- & ---- can make vegan french fries. "a dash of old fashion butcher shop with a pinch of culinary artistry mixed in" ... hell yeah. after talking about this place obsessively to josh, we decided to venture over there. the perfect spot to celebrate a hoosier victory in the ncaa tournament. w/ umami spices & avocado on a lettuce wrap bun. holy yum. this officially beats out tavern on rush as my favorite vegan burger in the city. it's so good ... and actually gets a nice little crust on the outside. i mean, it's still the type of thing you need to eat with a fork & knife. but that's okay because the flavor is there. oh, and adding the avocado makes a huge difference in deliciousness. highly recommended. 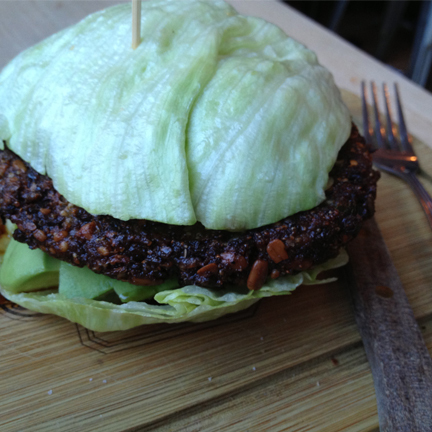 it is possible that another bun option at butcher & the burger is vegan. but i didn't ask because i wanted to save room (& calories!) 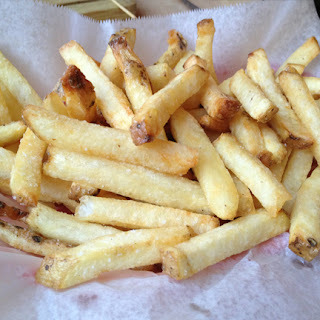 for the vegan french fries! they take a little longer to prepare, but damn are they worth the wait. fries are kind of my weakness, so i'm always super excited about some vegan ones. mmm. josh had the bison burger w/ goat cheese & ghost pepper. he loved it! 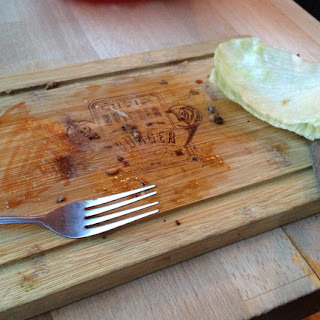 snarfed up every last bit (except half the lettuce bun). the butcher & the burger is most definitely a new favorite for me. (gosh, i've had two new favorites lately!) it's not the healthiest thing in the world. but it's so good, you won't even care. check it out! !